Why Do So Few People Pay Income Tax In India? : Parallels In a country with a population of more than 1 billion people, just 27 million paid taxes last year. Many Indians see no clear link between paying taxes and provision of government services. Salaried employees file their income tax papers at an tax office in New Delhi in 2013. Many Indians, including the entire agricultural sector and those living on less than $3,700 a year, are exempt from income tax. 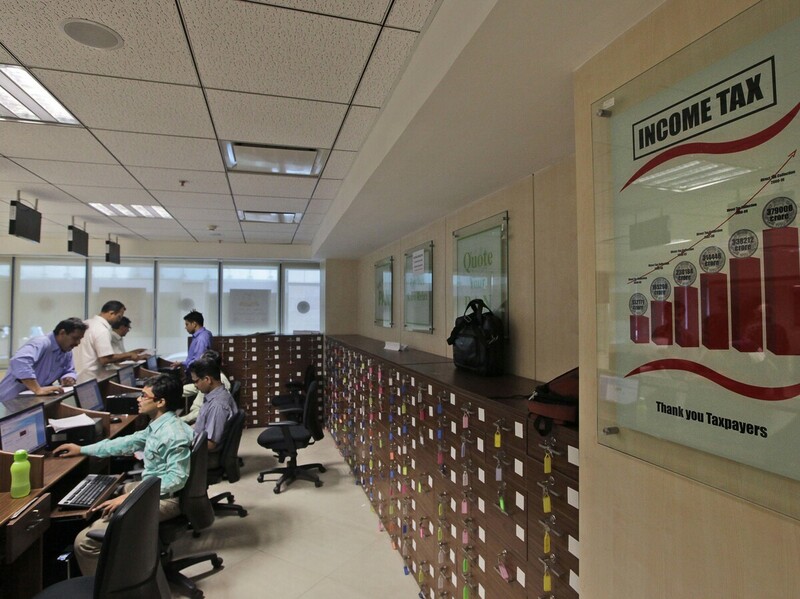 The Finance Ministry says just 27 million Indians paid income tax last year. Late last year, India sought to force people with large amounts of cash stashed away to deposit it in bank accounts. It was a tax-collecting exercise to get people to disclose unreported wealth and pay up. The government credits the move for a 12 percent increase in tax collections from the previous year. Enlarging that base is no small thing in a country where only a tiny percentage of people actually pays income tax. India ranks 13th of 18 among its democratic peers within the G-20 countries when it comes to paying tax, according to the country's 2017 Economic Survey. At a cavernous office complex in Gurgaon, Delhi's modern neighboring city, India's professionals are employed at corporate firms where tax compliance is high. That's in large part because taxes on the wages of this growing class of analysts, technocrats and consultants are directly withheld. Devika Dhingra, a 23-year-old analyst at PricewaterhouseCoopers, says she's proud to pay taxes "because I'd like to believe it's going toward helping someone." But her "building-the-nation" attitude puts her in a distinct minority. Dhingra says she finds herself in arguments with her peers, and says most people tell her, "Paying taxes is of no use to us because the government won't do anything for us." For them, she says, it is like pouring money "down a drain." Salaried workers can feel put upon "because we have to pay," says Nandita Upahaya, a 28-year-old environmental consultant. "Other [unsalaried] people who are richer than me, they are not paying tax." Her colleague, Abhishek Verma, 26, interjects with a view not often heard from Indian taxpayers. "Paying taxes is just like a legal instrument ... to make the government accountable," he says. It is, he believes, "just acquiring your rights." For Indians who are paid in cash, it can be easy to avoid tax payments. But the number of salaried workers represents only about 10 percent of the organized workforce. It's estimated that about half of Indians work in the informal sector, where the percentage of those who are tax-compliant tends to be far less than in the formal or organized sectors. In fact, an astonishingly small number of Indians actually pay taxes. Out of 37 million Indians who filed tax returns last year, 10 million were exempt, leaving just 27 million to actually pay anything, according to Finance Minister Arun Jaitley. That's a little more than 2 percent of the entire country. "Tax compliance is abysmal," says economist Mythili Bhusnurmath with the National Council of Applied Economic Research, an independent policy group. But she observes that a "significant segment" of Indians are exempt from income tax because they are too poor to pay. In a country where the per capita income is $1,600 per year, they fall below the approximately $3,700 annual income level required to pay taxes. "Income levels are low, so even if we are a population of 1.2 billion, there are not that many as a proportion of the population who can pay," Bhusnurmath says. Tens of millions of farmers are also exempt. In fact, India's entire agricultural sector — 55 percent to 60 percent of the country's entire workforce — falls outside the tax net. But Bhusnurmath says not only do lots of farmers in rich states like Punjab make considerable money, but their water, seeds and electricity are also subsidized. "So on the one hand, their inputs are cheap and their income from outputs is not taxed," Bhusnurmath says. "It's an inequity that needs to go." Deloitte tax analyst Rohinton Sidhwa says farmers are a politically sensitive group and are not likely to be pulled into the tax pool anytime soon. "No political party has actually grabbed the bull by the horns and said, 'It's time for some of you rich farmers to actually pay taxes,'" Sidhwa says. "And probably the reason for that is many of our politicians actually come from that class." 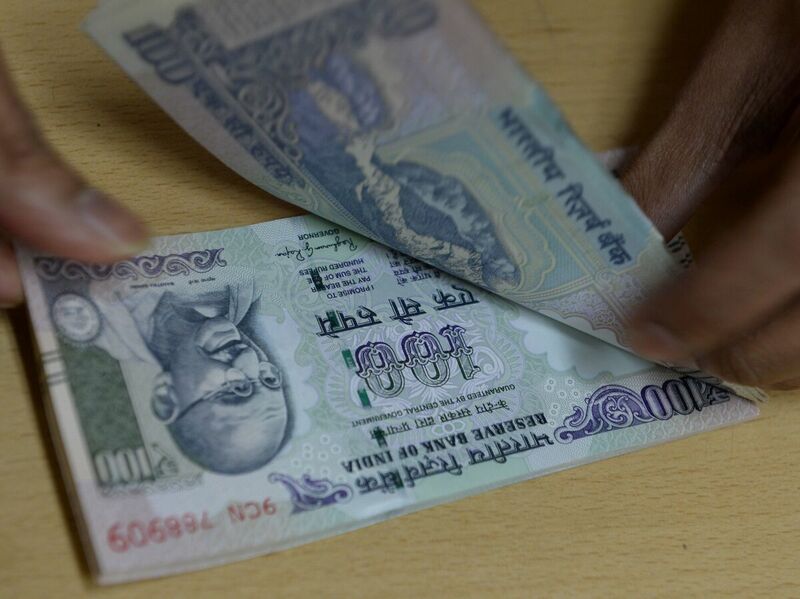 What Can India Teach Us About Abolishing High-Value Currency? Others argue that the taxable income level should be lowered to pull in more people. This year, the government proposed lowering the tax rate from 10 percent to 5 percent for those who make less than $7,600 a year, which would reduce tax revenues from that taxpayer category. But economist Kavita Rao of the National Institute of Public Finance and Policy says it's better to concentrate on making those already in the tax system pay everything they owe. "The monies don't come from bringing in the small guys. You have to be talking about the upper-income categories," Rao says. "That's where you'll get the big money from." It is easy to evade taxes in an economy such as India's, where cash has traditionally been the preferred mode of payment. With no paper trail, Rao says, the self-employed doctor, lawyer or factory owner can under-report income. "Businessmen will perhaps not pay all the taxes due," she says. But many would like to "pay a little tax. Cash allows you to play that game." At Delhi's Lajpat Nagar Central Market, business hums late into the evening. Vinod Gupta, the vice president of the market's traders' association, confirms that income tax evasion is prevalent among businesses that rely on cash. He says the small shop owners and stall vendors who make up about 25 percent of the market evade paying altogether. When asked how they manage that with tax inspectors investigating the local businesses, Gupta lets out a knowing laugh. "Sometimes they hire their services," he says. "They pay bribes" to officials to evade taxes, he explains. At other times, he says, the authorities may penalize the vendors with small fines or insist they "register with the tax department," meaning get compliant. Gupta says a large number of Lajpat Nagar traders — about half — don't pay everything they owe, but do pay something. "They are definitely paying," he says — just not enough. "I need some evidence to see things are functioning, right?" she says. Indians would like to see their substandard schools, hospitals and roads improved. Competing priorities can also leave citizens frustrated. Wealthy Gurgaon may like to see its roads fixed, while a rural village might prefer an anti-poverty program, says Rao. But Bhusnurmath, with the National Council of Applied Economic Research, says when an Indian earning roughly $4,000 a year sees no personal benefit from paying tax, he makes a choice: "I'm barely surviving, [the] government can perhaps get other sources of income" or "I'd rather cheat a little bit, maybe, and send my children to a better school or give them a better meal to eat." Kamal Jain, a businessman who runs a travel and money-changing business in Delhi's Old City, laments that he'll have nothing to show for paying taxes when it comes time for retirement. "If my future is secure, we're happy to pay the government," he says. But "while it's my duty to pay," he says, "they don't reciprocate with anything." In the absence of social security or guaranteed health care in old age, Indians rely on family members for their welfare rather than government. As long as that remains the bargain, India is unlikely to see any great improvement in tax compliance.